Leier scores on Linus Ullmark during warmups for the skills competition. 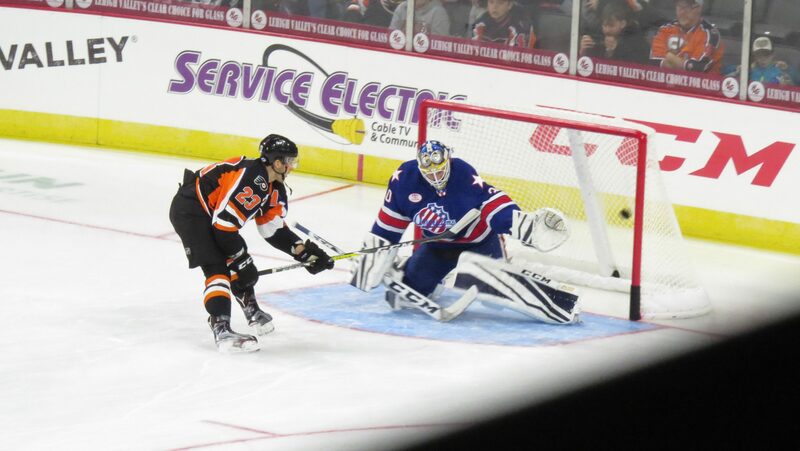 Wednesday night at the intersection of 7th and Hamilton, the Phantoms rebounded nicely following an acute case of “Saturday Night Fever” suffered four days previous in Wilkes Barre. Following that horrific loss, they played perhaps their best game of the season resulting in a 5-0 win versus the middling Binghamton Senators. Top marks to the blue-liners who contributed on not only on the score sheet but also in assisting Alex Lyon with the shutout. The two, recent, gruesome, losses are troubling, to be sure. There’s plenty to be said about consistent play. But both instances followed big wins and both times the team rebounded nicely. What does this mean down the stretch and for the playoffs? We can’t be sure, but it does point to the fact that this team can turn it on when it wants to–and what better reason to “want-to” than the playoffs? If they can’t get up for that, then it really doesn’t matter anyway. But we’ll watch that going forward. In come the Ice Caps for a two-game set starting tonight. The soon-to-be-defunct Canadien’s affiliate currently holds a playoff position in the weaker-than-Atlantic North division, but is 3-6-1 over their past 10. BUT, two of those wins have been in Wilkes Barre against the AHL’s top team. The Phantoms will need to continue to play hard and play together to win these two games. It was just on Wednesday, when the Phantoms won and the Ice Caps burried the Pens–yielding a little bump in the standings. I’m not scoreboard watching per se–It’s just nice when the chirps from the Wyoming Valley are quiet for a while. All Star F Taylor Leier continues to be sidelined by an ongoing injury which has been termed “minor” but which has also kept him out of sight for quite a bit of time already. He’s not expected to play at all this weekend, but has a chance to skate Tuesday in Wilkes Barre I suppose. Captain Colin McDonald has also missed time, but does have a chance to play tonight or tomorrow. F Corban Knight and F Mark Zengerle have been filling in on the top line alongside Scotty Laughton. The injuries to Leier and McDonald aren’t optimal, but that line did well Wednesday night. F Boyd Gordon got his knee crunched Wednesday night and had to be helped from the ice. Initial reports were very bad, but follow up seemed less dire. Still, I’m not planning on seeing Gordon any time soon. But we’ll see. There was no call-up to Philadelphia for last night’s Flyers loss, as Philadelphia rolls with 12 healthy forwards following the Travis Konecny injury. With Leier, Gordon and possibly McDonald out, we should get one from Reading today. Probably Swavely, but perhaps Goulbourne? EDIT: F Chis McCarthy is in town, and Weal has been recalled to the Flyers with Konecny to IR. Last night the Royals had their six-game win streak snapped. They’ve got Norfolk tomorrow and Sunday at the Santander. The Ice Caps arrive in Allentown for two games starting tonight. Look for ex-Penguins penalty monger F Bobby Farnham as well as ex-Pens defender Philip Samuelsson. 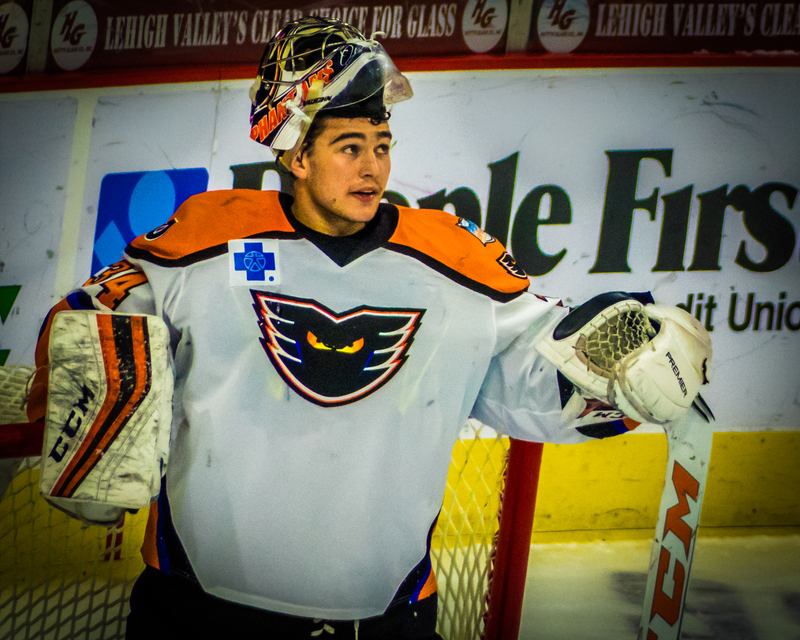 Ex-Adirondack-era Phantom Yann Danis could be in net tonight. Tickets and Parking: Seats still remain for this game, on the primary and secondary markets–but could be going fast. Acquire tickets before heading downtown tonight. No parking issues to report; all lots and decks should be open as per usual following the storm. Pre-Game: TV Live from Chickie’s at 6:30PM; Radio at 6:20PM for your drive downtown. Wednesday I was a little later getting downtown, but still had some reasonable food and drink at the Hook happy hour. It’s just down the arts walk and not crowded at all before games. Plenty of space at the bar or at the bar tables nearby if you don’t want to have a full dinner. Happy Hour specials are good. Tonight some special friends will be in town. 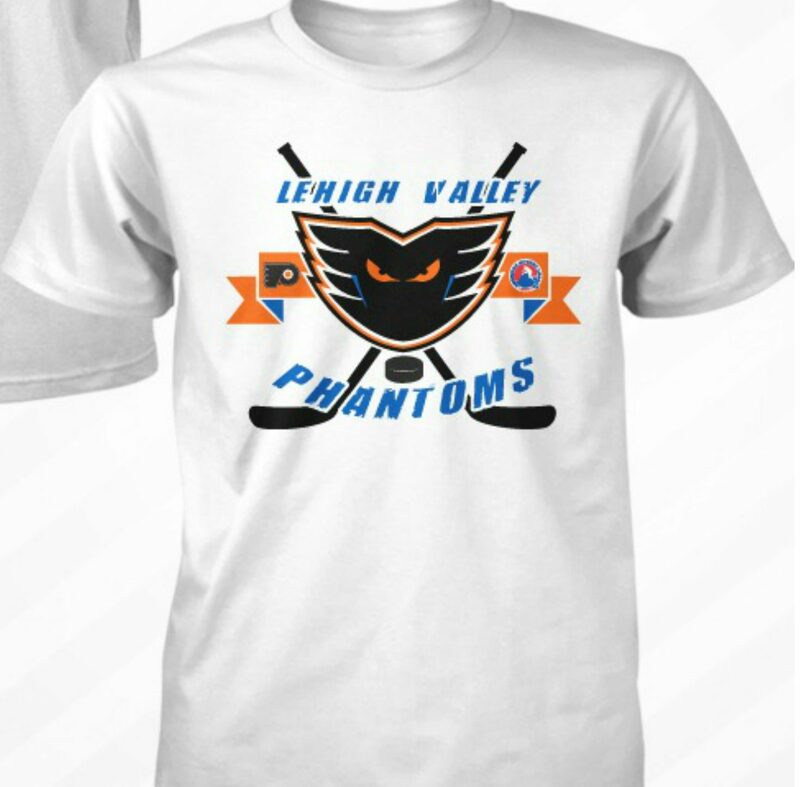 They’re from Philly, and were season ticket holders at the Spectrum for the Phantoms inaugural season there. I think we’ll be relaxing at Bell Hall before the game, and if we do post-game we’ll likely drop in at the Dime bar. As per usual, watch who leads the Phantoms onto the ice. If it’s about the hot hand, you have to go Lyon tonight. Although, as we mentioned above, it’s really more about the defenders than it is the puck-tamers at this juncture. Watch the defenders. That’s the key to our game. We have the depth on attack, but if the defenders aren’t keeping things tight in our own zone and aren’t defending the blue line, then that’s when things have the potential to get out of hand. Watch to see if Colin McDonald can make it back for this game. Watch to see how the lines might shuffle if he doesn’t. I’d likely slot Swaves or Gillz (or McCarthy) in on the fourth line and continue with Knight and Marky Z on top with Laughts. Continue to keep an eye on TJ Brennan. As I mentioned Wednesday, I’m all for standing up for teammates and fighting when necessary–but the All Star is more valuable to us out on the ice than sitting in the box. Be smart about it TJ: A TJ/Farnham trade is not one I want to make tonight or tomorrow. Watch for the orange alternates: They might sport those either tonight or tomorrow. “Hockey Night In Allentown” will be on hiatus tomorrow for the re-match with the Ice Caps. The team will head back to Casey Plaza in Wilkes Barre to try to avenge their recent massacre with a Tuesday night Valentines Day special. It should be interesting to see how they respond returning to the scene of the crime. Next Friday and Saturday Hartford will be in town for two before the Phantoms head up to Utica on Sunday. St. John’s IceCaps have been faithfully rotating their two goaltenders for quite some time — such previous behavior leads me to believe that it is Charlie Lindgren’s turn to start tonight (Friday) and Danis will start on Saturday.